Though it's only three games, the Pittsburgh Penguins likely couldn't have pictured a worse start to the season that didn't involve injuries of some sort. An offense that brought in one of the league's best goal scorers and improved the depth throughout the four lines has managed just three goals, and the defense is playing towards the pessimistic end of preseason predictions, which weren't very promising to begin with. The season is still young, but at what point is it reasonable to start to worry? Adam Gretz wrote about four teams off to poor starts, and whether it was time to panic. The stats he cites certainly paint a bad picture: the team is 5-14-4 in their last 23 games with just 36 goals scored over that time frame. Despite the offseason additions, the offense has managed just 3 goals in 3 games this year. In the end, he decides it's not quite time to panic yet for the Pittsburgh Penguins, as he doesn't correlate the troubles at the end of last season to the troubles the team is facing today. It's easy enough to differentiate between the two teams. On the one hand you have an injured, short-handed team limping towards the finish line of the season, while on the other you have a team with multiple new players breaking into the lineup stumbling out of the gate. But while the two situations are very different, the root cause for the team's struggles remains the same: an overmatched defense. The biggest difference is that it wasn't supposed to be this way last year. With Kris Letang, Olli Maatta, and Christian Ehrhoff out of the lineup, what was supposed to be an excellent blueline began to crumble from lack of depth. The salary cap situation left 5 players doing the work of 6. And yet, the team as a whole deserved better results. After March 6 of last season, the Penguins still had a 54.8 CF% at even strength. Even adjusting for score effects, since they were trailing during many of those games, they still posted a 54.2 SACF% over that time period - 3rd best in the entire league. They were surviving being stretched thin on the blue line, to an extent. What doomed the team was a stretch of bad luck with an even strength PDO of 97.2 over that stretch and a power play that continued to reach new lows, going 7 for 52 (13.5%) when the team could have used the boost in scoring the most. While the underlying numbers didn't show cause for concern over that small sample size last year, the outlook hasn't been quite as good to start this year. Understanding the small sample size, the Pens have posted a 47.6 CF%. That number drops even further when accounting for score effects, placing them in the bottom 5 of the NHL at a 44.8 SACF%. And it's been noticeable on the ice as well, as the team has routinely been pinned deep in their zone. The difference this year is that the healthy defense consists of Kris Letang, a rusty Olli Maatta still showing the effects of the shoulder surgery and time off, and a bunch of defensemen who are bottom pairing caliber or worse. So, when is it time to worry? Well, it probably depends on what you want to focus on. The Pens will find some better puck luck than the 96.2 PDO they're currently sporting. Even with the lack of depth on defense, the team as a whole is going to improve on the possession numbers, and the power play remains too talented to be kept off the score sheet. There's no use worrying about these types of things, as they're likely to correct themselves over the course of the season. Unfortunately, the defense won't become more talented without subtracting from the current roster, and even expecting those numbers to bounce back it remains to see at what level "normal" is for the Penguins with this blue line. Some things probably won't change though, and they're just as problematic as some of the other concerns. The team continues to play Rob Scuderi regardless of how awful he's been, how even further limited he is by what Mike Johnston wants to do, and the presence of other options that have a much higher ceiling. Adam Clendening is a young player already on the roster who is capable of providing things that players like Scuderi, Dumoulin, and Lovejoy aren't. Derrick Pouliot is a player who despite the defensive questions (and at this point, likely shaken confidence too) offers enough in transition, possession, and the offensive zone to at least warrant a look as the defense flails. Tim Erixon likely doesn't have what it takes to succeed in the NHL, but it's not like the bottom half of the lineup is playing anyone out of contention right now. The team badly misjudged the situation on the blueline in the offseason and will likely have to wait until Dupuis and Fehr return to the lineup before addressing it via trade, and the big philosophical change for a power play that embarrassingly squandered an embarrassment of talent with the man advantage was to demote Evgeni Malkin to the second unit. This all coming under the former junior coach who has the team playing at a junior hockey level in an increasing number of facets with his simplistic system and intense practices and workouts on non-game days. 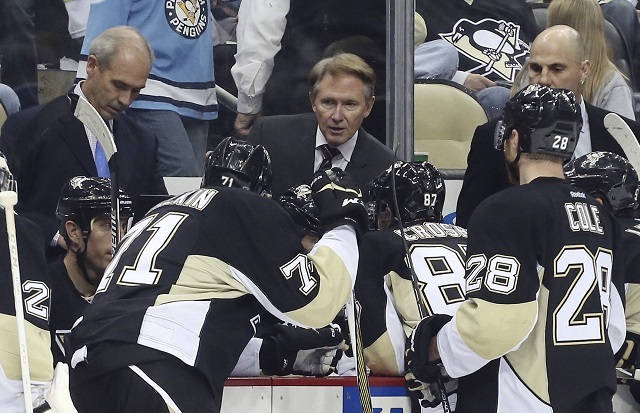 While an 0-3 start is far from ideal, there are reasons to believe the Pens will bounce back. The team's far too talented up front for them not to be able to make an impact, and they do have some pieces in the organization not currently in the starting lineup who can help plug some of the leaks, to a certain degree. The problem is that there are reasons to believe that there's a deeper problem brewing that will have the team needing to overcome its own mistakes and the positions they are willing placed into. How much worry that entails, and at what time that's appropriate, will surely become more clear in the upcoming weeks and months.